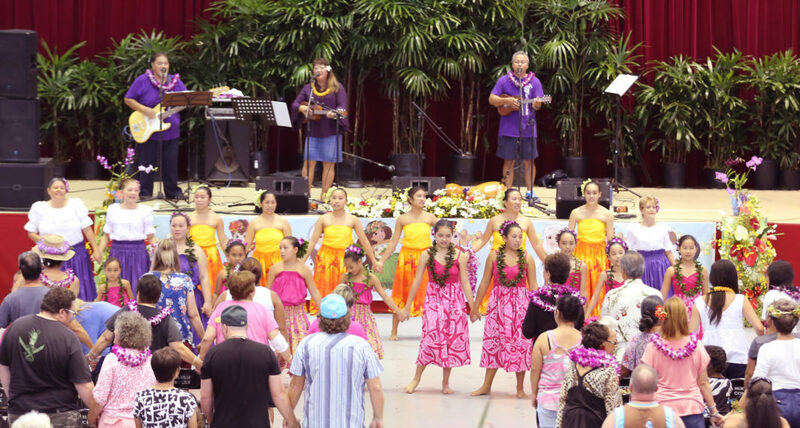 In the Hawai’ian spirit of ‘Aloha’, a sunny day warmly embraced more than 1000 citizens and visitors attending the Eighth Annual Hilo World Peace Festival held on Saturday, October 21, 2017 in Hilo, Hawai’i. Harry Kim, the Mayor of Hawaii Island, continued the annual tradition started by former Mayor Billy Kenoi and added to it by donating the use of a new, larger venue. Mayor Kim stated, “I don’t think there’s anything more important than what this is all about…peace on earth.” And he promised that, for 2018’s World Peace Festival, he would work toward even greater community participation by involving local schools in the event. This year, because of the Mayor Kim’s efforts, the 2017 World Peace Festival moved from Hilo’s sacred “Coconut Island” to Hilo’s Afook-Chinen Civic Auditorium. The indoor venue, able to hold thousands of people, displayed the flags of 193 countries accenting the global importance of their local efforts for world peace. Also present was a series of moving anti-violence graphic displays provided by V.O.V. (Victory Over Violence). Further enhancing the event, beautiful floral arrangements (created by a crew led by Annette Uyeda) provided a lush background for the stage performers while festival attendees were greeted by yet more bouquets and traditional Hawai’ian leis. Many people including Mayor Kim and staff expressed their appreciation for the numerous volunteers, working behind the scenes, who made this year’s festival not only possible but wonderful. After welcoming the attendees and participants, Penny Keli Vredenburg, Mistress of Ceremonies introduced Kumu Hula (master Hula Dance Instructor and Cultural Advisor) James “Kimo” Luluhiwalani Awai III who, through a participatory Hawai’ian call and response, unified the participants with the festival’s purpose of creating a peaceful world. Following Kimo’s invocation, Penny then introduced one of the partners of the event, International Committee of Artists for Peace (“ICAP”) represented by Carol Clayton. Carol, on behalf of ICAP’s board (including Herbie Hancock, Carlos Santana, Wayne Shorter, and Patrick Duffy), thanked the festival’s co-sponsors; The County of Hawaii, Destination Hilo, SGI-USA, and especially Mayor Kim for helping make the festival a success, thus spreading the message of Aloha and peace through the power of art. The Mayor spoke of the importance of Hawai’i for its multiracial and multicultural nature of Hawai’i, that we are from all people and responsible to all people. The Mayor also spoke about establishing Mauna Kea (Hawai’i’s dormant volcano, which has a naturally occurring heart shape at its center) as a national monument, symbolizing world peace. Performances for the festival lasted from 10:00 a.m. to 3 p.m. included an entertainment line-up Lopaka, Hula by the Hilo SGI Group, Randy Skaggs, Lori Lei Shirakawa, contemporary music by Vaughn Valentino, To’a Here Tahitian Revue, and a short performance by the cast of the musical “Shout”. Penny Keli Vredenburg, Mistress of Ceremonies, by show of hands, asked the audience where they lived. Participants learned that the Festival, characteristic of its international nature, was attended not only by individuals from the Big Island, but by residents of Canada, England, Japan, and the Continental United States who had specifically travelled to attend the Festival. Festival sponsors had booths set up around the periphery of the main floor where additional information about their activities could be obtained. Local culinary treats also delighted the attendees.